Mislabeled as Disabled is a bracing call to arms that challenges the state of American education. 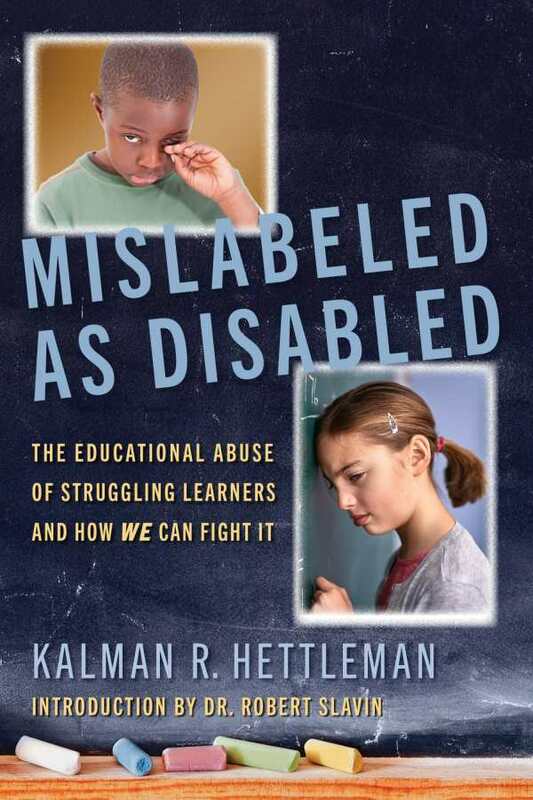 Struggling learners are routinely failed by academic institutions, stuck in an unending cycle of underachievement, as Kalman R. Hettleman’s Mislabeled as Disabled shows. Hettleman’s book traces such inequities and provides a road map for fixing a broken system. With examples of school children being labeled as one kind of learner when in fact they have other educational needs—such as children from low-income families who are wrongly diagnosed as having low IQs when they suffer from dyslexia—Hettleman, a Baltimore City school board member and national educational reform crusader, lays out the story like a well-structured crime novel. Here, the victims are innocent children who are disadvantaged by misguided but well-intentioned educators and state regulators. Examples—such as of middle and high school students reading at kindergarten grade levels despite solid attendance records—are baffling, and Hettleman counters the problems with the current system with examples of battle-tested strategies that encourage academic success. While arguments that America’s public education system is in need of an overhaul are nothing new, this indictment of special education initiatives specifically is surprising. Hettleman’s arguments are backed by hard data showing that children with special needs are not receiving the instruction they need and that, even when those students graduate, grade inflation renders their diplomas meaningless. This and other examples are indictments of a flawed system. Chapters of damning evidence are followed by sensible solutions for fixing the system. The book is precise in naming prospective methods, including paying teachers more, implementing strategies that work, and filing lawsuits in the hopes that such drastic moves might spur state and federal governments to action. It includes familiar suggestions alongside new ideas that are bound to surprise educational reformers and parents alike. Written with clarity and a sense of urgency, the book is aimed at teachers, administrators, and legislators, as well as at parents and caregivers—perhaps the most important factions of its audience. The tone is strong and authoritative, and the quality of the writing reflects attention to detail while using language that any general reader will understand. Mislabeled as Disabled is a bracing call to arms, as much a look at the state of American education as it is a study of society at large. It is an invaluable resource for those set to do battle to change educational systems, and it encourages spirited debate among those working at all levels of academia.